Four Japanese transports, hit by both U.S. surface vessels and aircraft, beached and burning at Tassafaronga, west of positions on Guadalcanal, on November 16, 1942. They were part of the huge force of auxiliary and combat vessels the enemy attempted to bring down from the north on November 13th and 14th. Only these four reached Guadalcanal. They were completely destroyed by aircraft, artillery and surface vessel guns. After Pearl Harbor the Japanese quickly gained control over a huge area of the Pacific, from the Philippines to Burma to the Aleutians to the Solomons. While the Japanese enjoyed the advantage of interior lines of communication, they had somewhat overextended themselves. Once the Allies became strong enough to threaten their perimeter from several directions, the advantage would be lost, since Japan did not have and could not produce enough planes and ships to defend in force at all points. The turning point in the Pacific theatre came in mid-1942 with history’s first great carrier battles. In June 1942, Japan hoped to capture Midway Island, an American held base about 1000 miles from Hawaii. Midway could have been used as a staging point for future attacks on Pearl Harbor. The United States was still benefiting from being able to decipher Japanese radio messages. American naval commanders led by Chester Nimitz therefore knew the assault was coming. 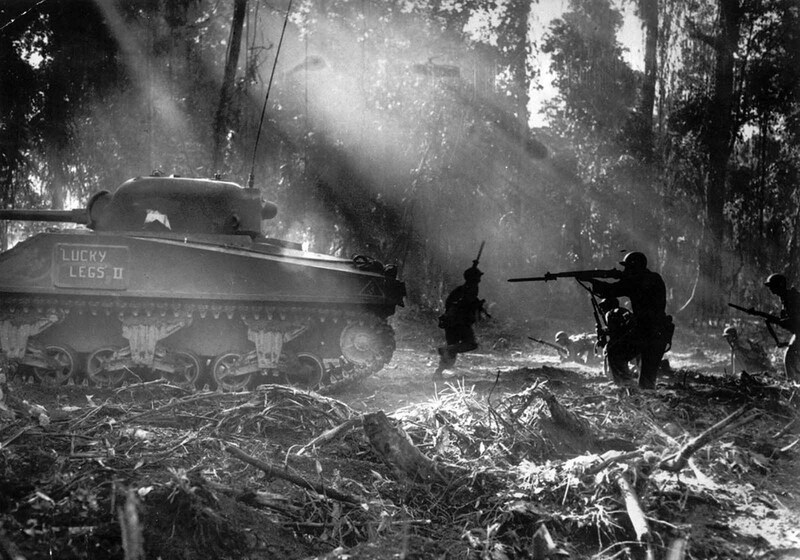 Following in the cover of a tank, American infantrymen secure an area on Bougainville, Solomon Islands, in March 1944, after Japanese forces infiltrated their lines during the night. Airplane combat decided the Battle at Midway. After the smoke had cleared, four Japanese aircraft carriers had been destroyed. The plot to capture Midway collapsed, and Japan lost much of its offensive capability in the process. After the Battle of Midway, the Japanese were forced to fall back and defend their holdings. 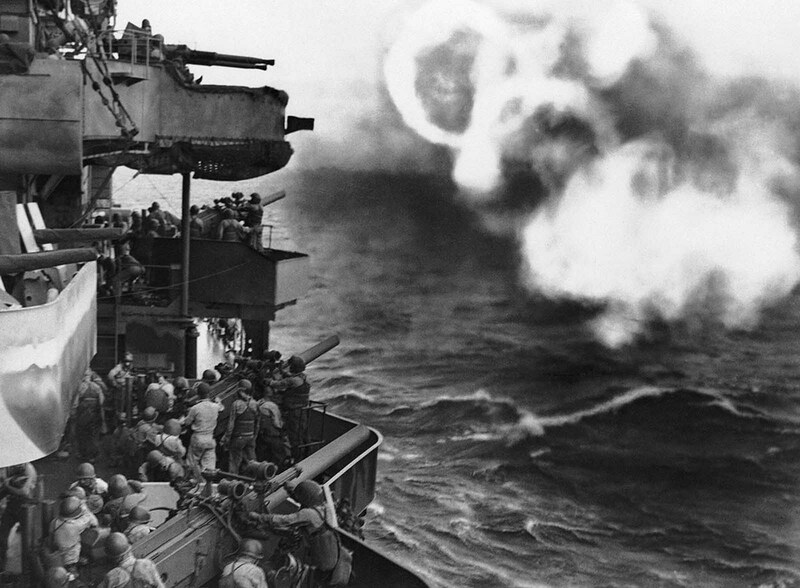 After the Battle of Midway, the Allies were able to launch a counter-offensive. The first stage of the offensive began with the Navy under Admiral Nimitz and Marine landings on Guadalcanal and nearby islands in the Solomons. At the same time, the Army under General MacArthur with Australian allies set out to take New Guinea’s Papuan peninsula. After long, bloody struggles, both campaigns succeeded. From this point on, Nimitz and MacArthur engaged in island-hopping campaigns that bypassed strongly-held islands to strike at the enemy’s weak points. Campaigns against the Aleutians and Rabaul succeeded in stopping the Japanese advances and secured bases for Allied advances on Japan. 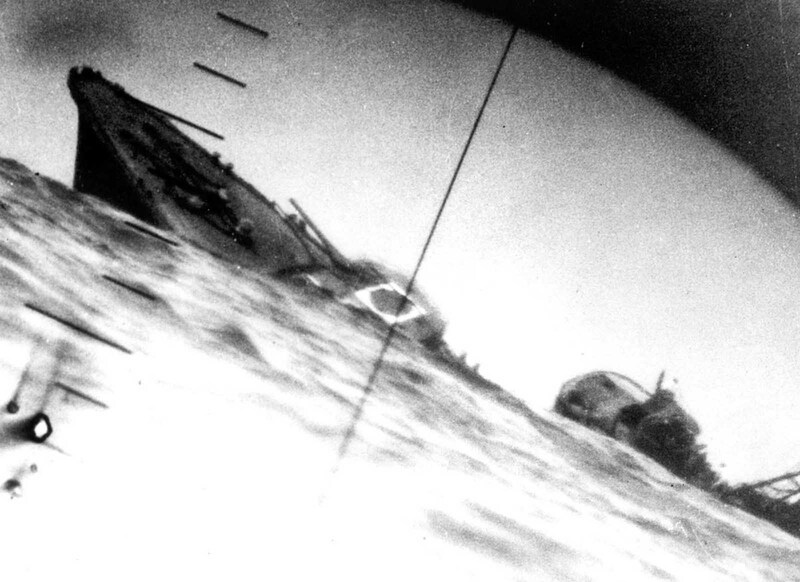 Torpedoed Japanese destroyer Yamakaze, photographed through periscope of USS Nautilus, 25 June 1942. The Yamakaze sank within five minutes of being struck, there were no survivors. While MacArthur pushed along the New Guinea coast, preparing for his return to the Philippines, Nimitz crossed the central Pacific, via the Gilberts, Marshalls, Marianas, Carolines, and Palaus. Once the Marianas were taken, it would be possible to use them as bases from which the new long-range B-29 bombers could strike at the heart of Japan. The advance through the Central Pacific got under way in November 1943 with the seizure of two islands, Tarawa and Makin in the Gilberts. Marines landed on Tarawa on November 21 and took the island in a four-day fight at a cost to the Marines of some 3,000 casualties. Army troops overwhelmed the small Japanese garrison on Makin between November 20 and 24, 1943. 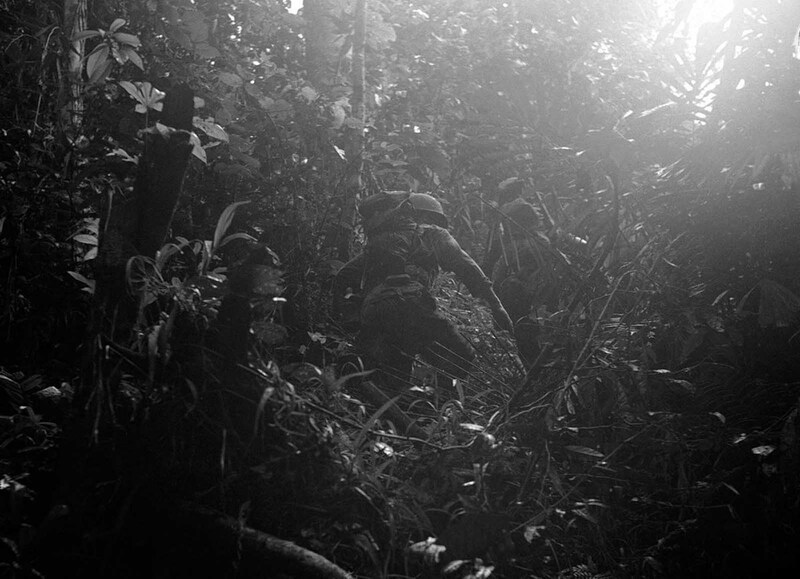 American reconnaissance patrol into the dense jungles of New Guinea, on December 18, 1942. Lt. Philip Winson had lost one of his boots while building a raft and he made a make-shift boot out of part of a ground sheet and straps from a pack. 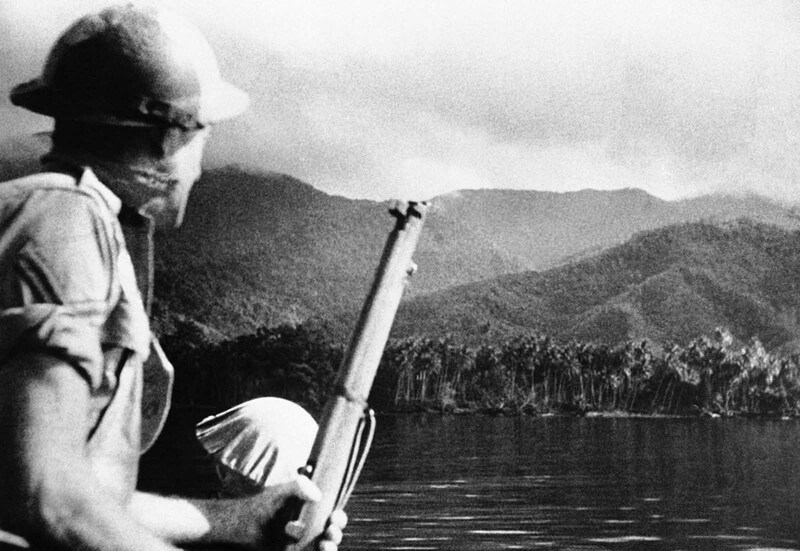 A helmeted Australian soldier, rifle in hand, looks out over a typical New Guinea landscape in the vicinity of Milne Bay on October 31, 1942, where an earlier Japanese attempt at invasion was defeated by the Australian defenders. During January and February 1944, Admiral Nimitz proceeded to positions in the central and western Marshalls. The principal islands taken were Kwajalein, which was invaded by an Army force on February 1, and the islands of Roi and Namur, which were invaded by Marines on February 3 and 6. From Kwajalein a naval task force, moving west 340 miles with a regiment each of Marines and infantry, captured a Japanese air base on Engebi in the Eniwetok Atoll on February 17-19, 1944. Meanwhile, on February 16, Nimitz had launched a massive carrier raid on Truk in the central Carolines, long considered Japan’s key bastion in the central Pacific. This raid revealed that the Japanese had virtually abandoned Truk as a naval base, and a plan to assault that atoll in June was abandoned. Instead, Nimitz drew up plans for an invasion of the Marianas in June, to be followed in September by an advance into the western Carolines. 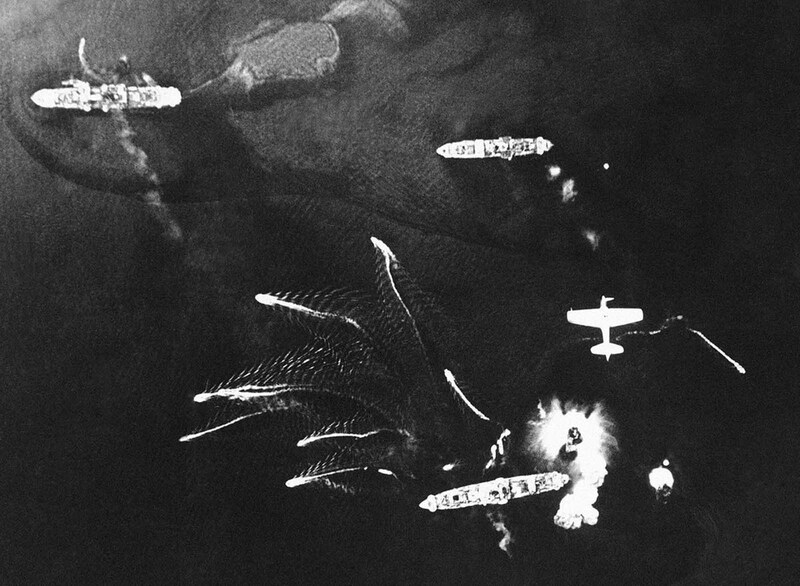 Japanese bomber planes sweep in very low for an attack on U.S. warships and transporters, on September 25, 1942, at an unknown location in the Pacific Ocean. Admiral Nimitz invaded the Marianas in June 1944. Amphibious assaults were made on Saipan on June 15, on Guam on July 20, and on Tinian on July 23, 1944. All three islands were strongly garrisoned by Japanese troops who contested every yard of ground. Loss of Saipan precipitated a political crisis in Tokyo and brought about the fall of the Tojo Cabinet. The Japanese sallied forth to offer battle to the U.S. Pacific Fleet. They hastily reassembled their fleet from Biak and the Philippines and sailed north to defend the Marianas area, but lack of land-based air support made it impossible to surprise the U.S. naval contingents under Admiral Spruance. 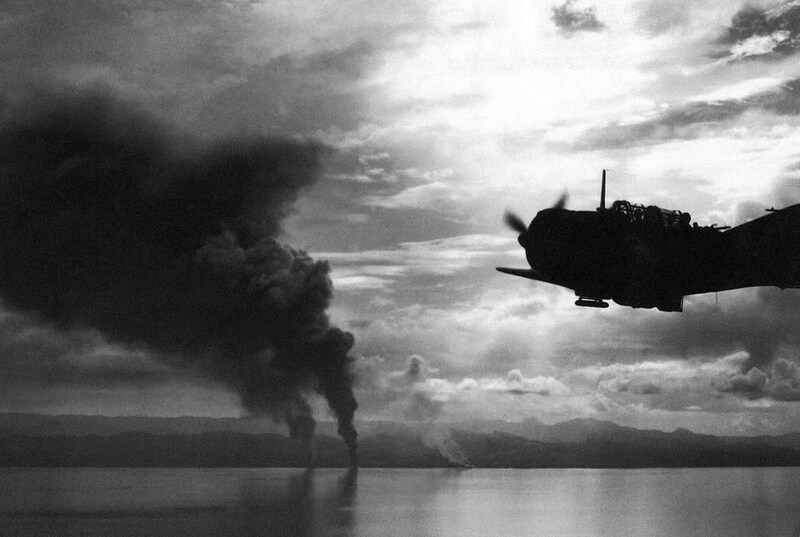 In a massive air battle that took place on June 19, 4 days after landings on Saipan, the Japanese lost more than 400 planes to an American loss of less than 30. Stripped of carrier planes, the Japanese fleet fled westward, but American planes in pursuit were able to sink several vessels, including three carriers. On August 24, 1942, while operating off the coast of the Solomon Islands, the USS Enterprise suffered heavy attacks by Japanese bombers. 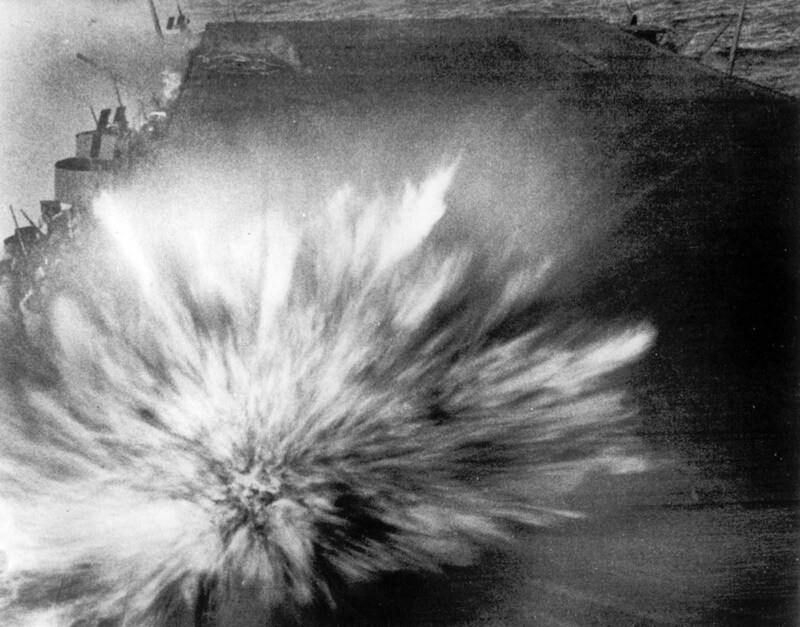 Several direct hits on the flight deck killed 74 men; the photographer of this picture was reportedly among the dead. During this engagement, known as the Battle of the Philippine Sea, only three American ships were damaged. This victory paved the way for eventual success in the Marianas, and provided a demonstration of the interdependence of operations in the Southwest and Central Pacific Areas. Capture of the Marianas brought Japan within reach of the Army Air Forces’ huge new bomber, the B-29, which was able to make a nonstop flight of the 1,400 miles to Tokyo and back. Construction of airfields to accommodate B-29’s began in the Marianas before the shooting had stopped, and in late November 1944 the strategic bombing of Japan began. 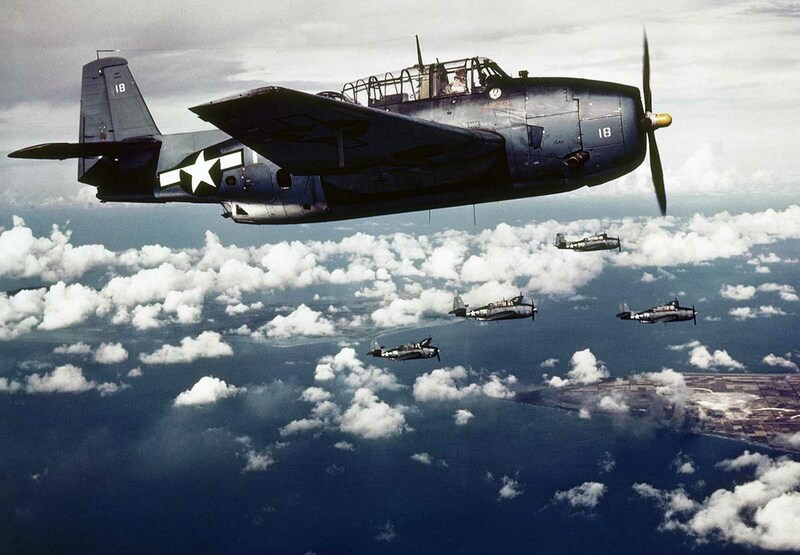 The last two major campaigns of the Pacific war – Luzon and Okinawa -were still to come. But Japan was essentially beaten. It was defenseless on the seas; its air force was gone; and its cities were being burned out by incendiary bombs. The atomic bombings of Hiroshima and Nagasaki on August 6 and 9 and the Soviet declaration of war on 8 August forced the leaders of Japan to recognize the inevitable. On August 15, 1945, Emperor Hirohito announced Japan’s surrender and ordered Japanese forces to lay down their arms. Since the war in Europe had already been won, V-J Day, September 2, 1945, marked the end of the greatest war in human history. 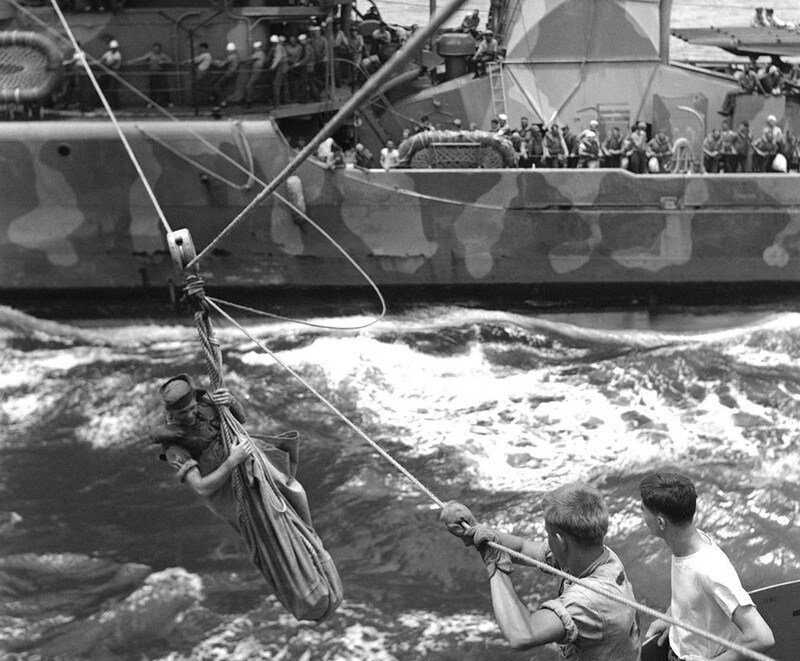 A breeches buoy is put into service to transfer from a U.S. destroyer to a cruiser survivors of a ship, November 14, 1942 which had been sunk in naval action against the Japanese off the Santa Cruz Islands in the South pacific on October 26. The American Navy turned back the Japanese in the battle but lost an aircraft carrier and a destroyer. 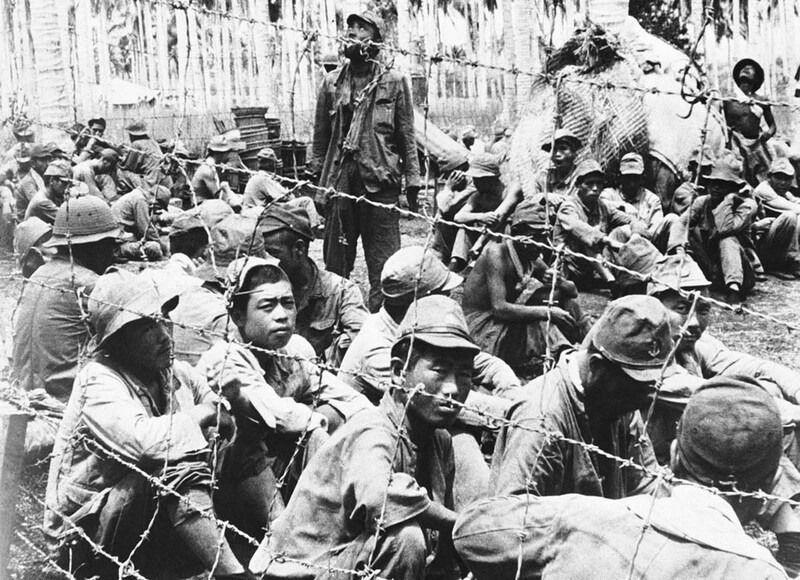 These Japanese prisoners were among those captured by U.S. forces on Guadalcanal Island in the Solomon Islands, shown November 5, 1942. 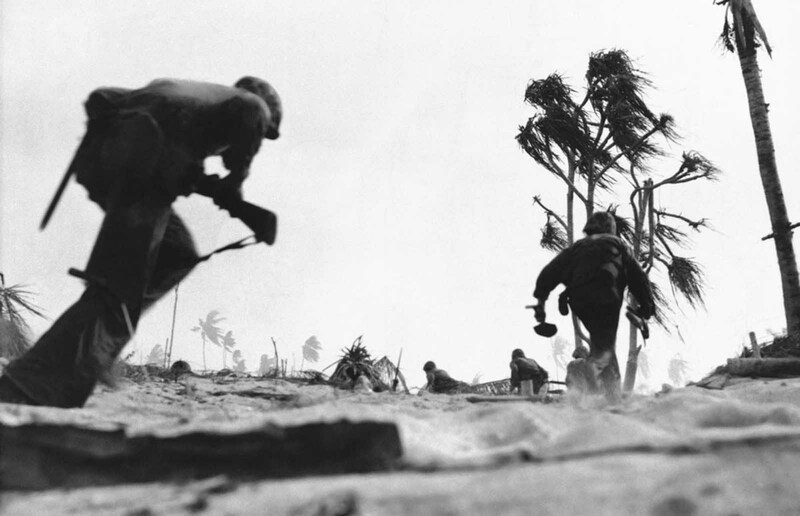 Crouching low, U.S. Marines sprint across a beach on Tarawa Island to take the Japanese airport on December 2, 1943. Secondary batteries of an American cruiser formed this pattern of smoke rings as guns from the warship blasted at the Japanese on Makin Island in the Gilberts before U.S. forces invaded the atoll on November 20, 1943. 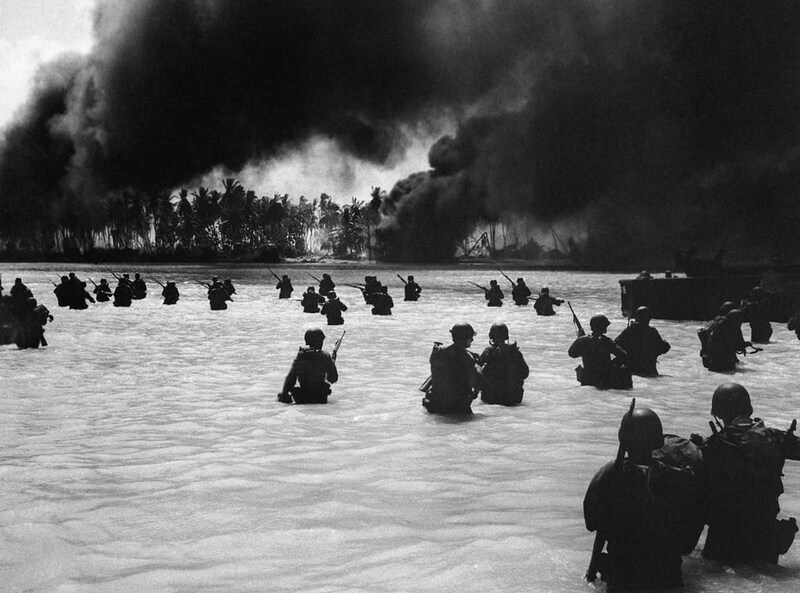 Troops of the 165th infantry, New York’s former “Fighting 69th” advance on Butaritari Beach, Makin Atoll, which already was blazing from naval bombardment which preceded on November 20, 1943. The American forces seized the Gilbert Island Atoll from the Japanese. 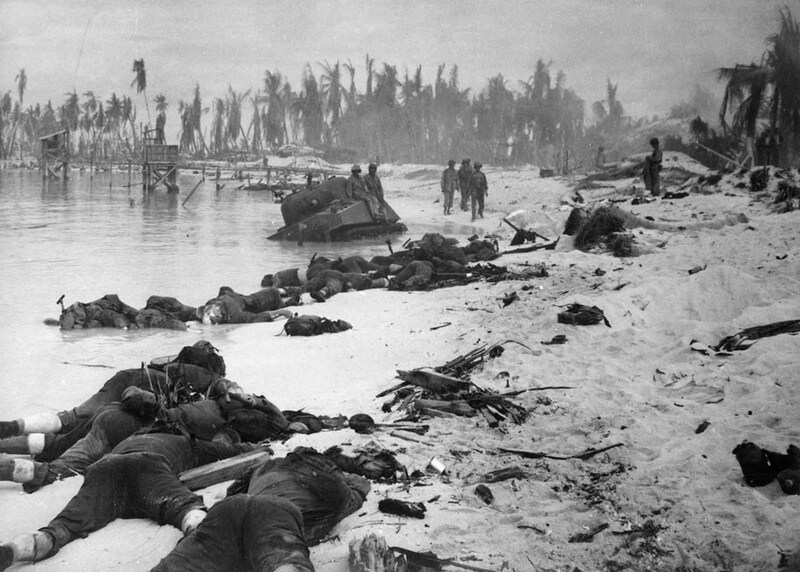 Sprawled bodies of American soldiers on the beach of Tarawa atoll testify to the ferocity of the battle for this stretch of sand during the U.S. invasion of the Gilbert Islands, in late November 1943. 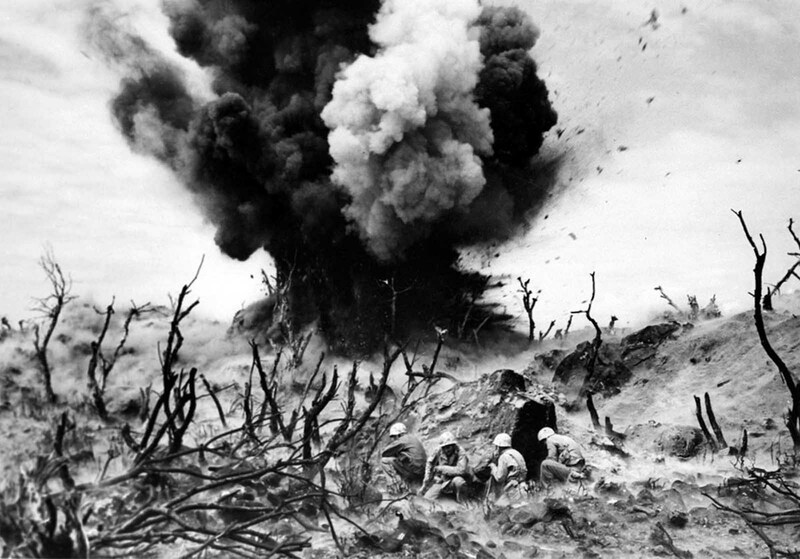 During the 3-day Battle of Tarawa, some 1,000 U.S. Marines died, and another 687 U.S. Navy sailors lost their lives when the USS Liscome Bay was sunk by a Japanese torpedo. 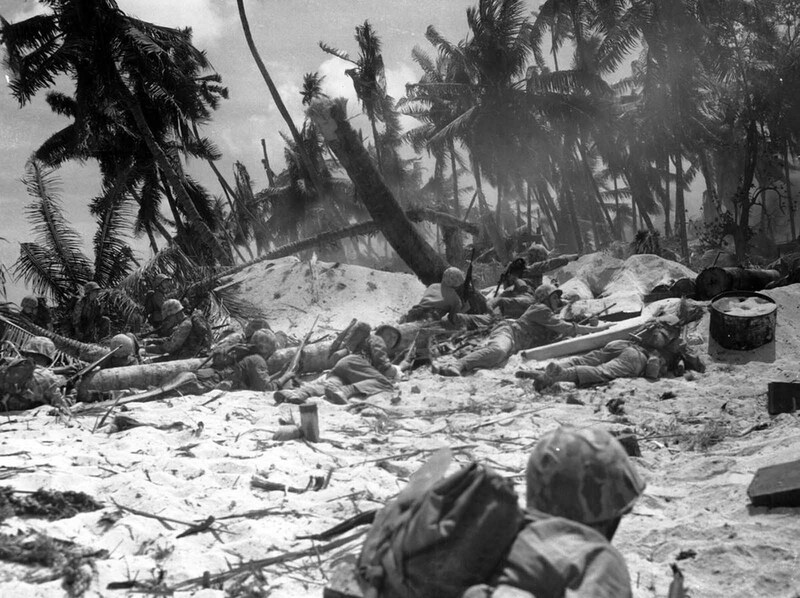 U.S. Marines are seen as they advance against Japanese positions during the invasion at Tarawa atoll, Gilbert Islands, in this late November 1943 photo. Of the nearly 5,000 Japanese soldiers and workers on the island, only 146 were captured, the rest were killed. 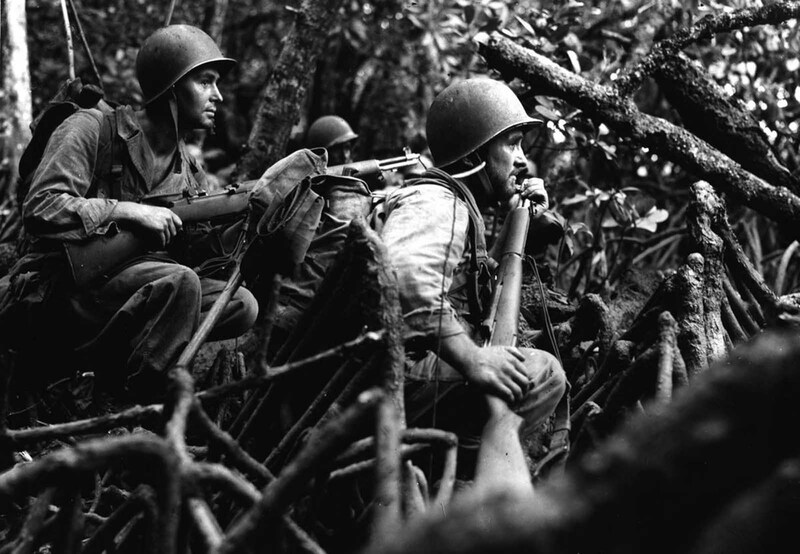 Infantrymen of Company “I” await the word to advance in pursuit of retreating Japanese forces on the Vella Lavella Island Front, in the Solomon Islands, on September 13, 1943. 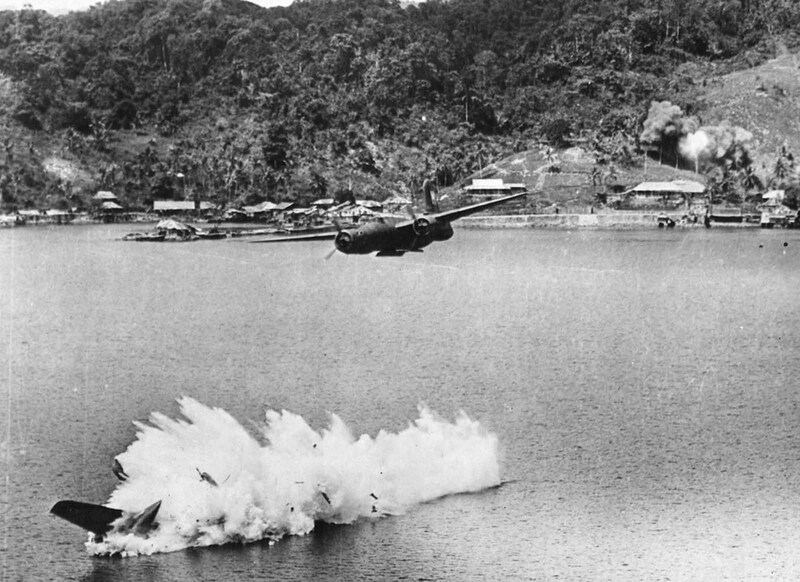 Two of twelve U.S. A-20 Havoc light bombers on a mission against Kokas, Indonesia in July of 1943. The lower bomber was hit by anti-aircraft fire after dropping its bombs, and plunged into the sea, killing both crew members. 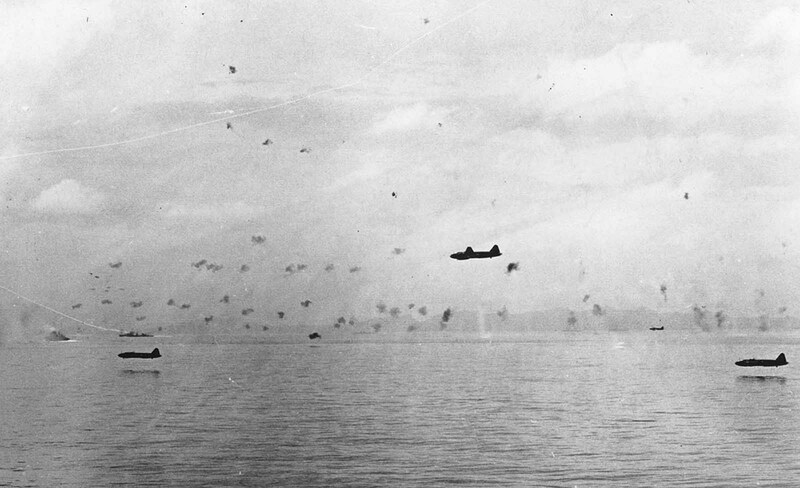 Small Japanese craft flee from larger vessels during an American aerial attack on Tonolei Harbor, Japanese base on Bougainville Island, in the Central Solomon Islands on October 9, 1943. 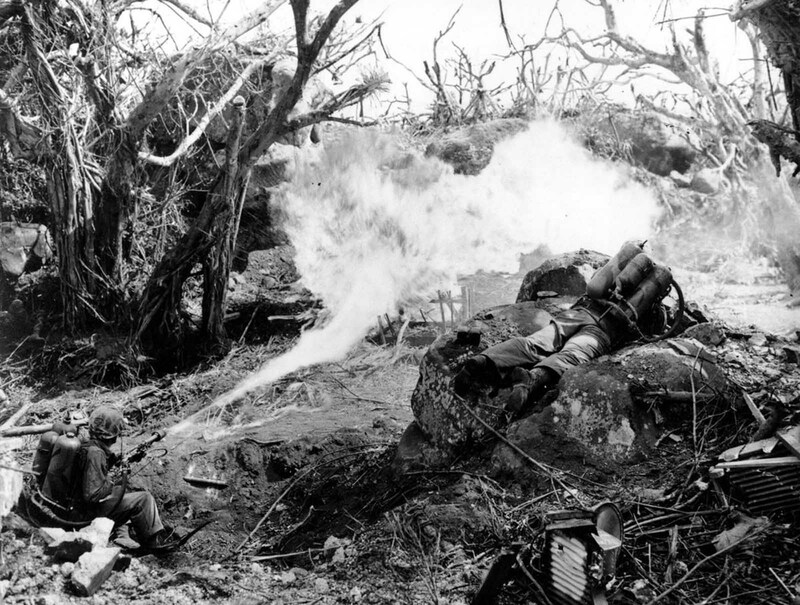 Two U.S. Marines direct flame throwers at Japanese defenses that block the way to Iwo Jima’s Mount Suribachi on March 4, 1945. On the left is Pvt. Richard Klatt, of North Fond Dulac, Wisconsin, and on the right is PFC Wilfred Voegeli. A member of a U.S. Marine patrol discovers this Japanese family hiding in a hillside cave, June 21, 1944, on Saipan. 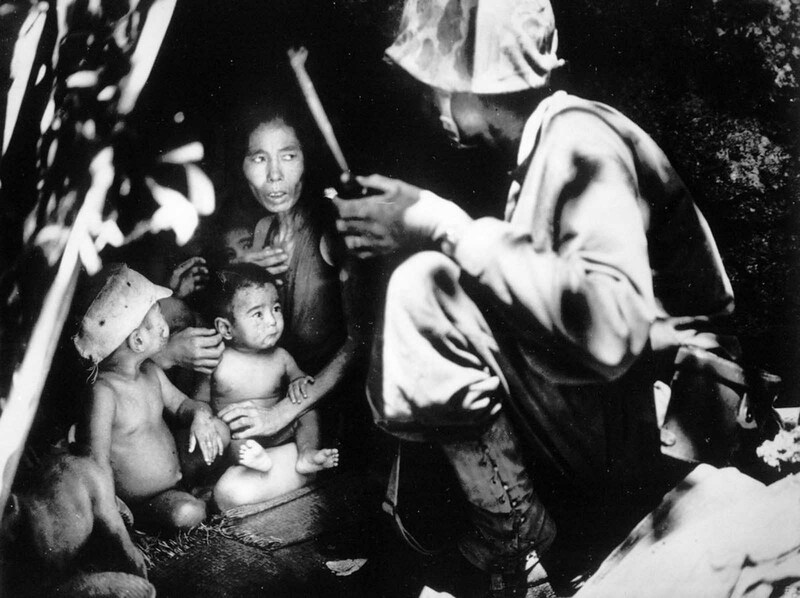 The mother, four children and a dog took shelter in the cave from the fierce fighting in the area during the U.S. invasion of the Mariana Islands. 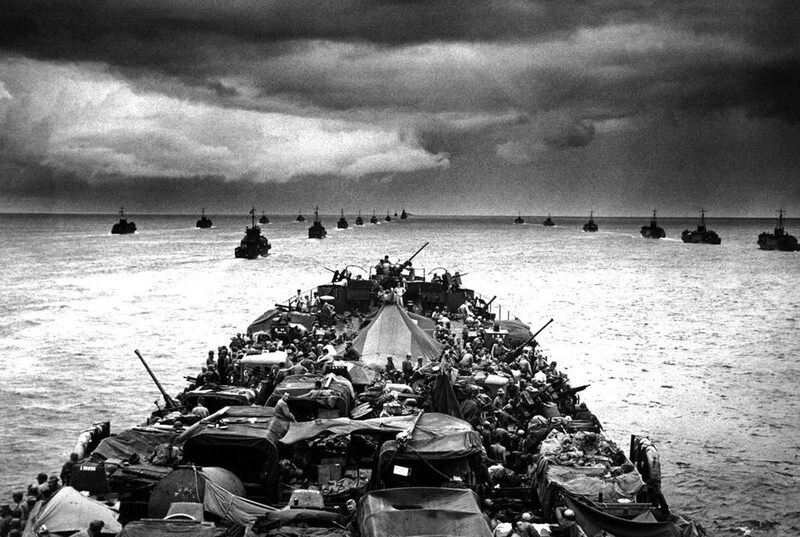 Columns of troop-packed LCIs (Landing Craft, Infantry) trail in the wake of a Coast Guard-manned LST (Landing Ship, Tank) en route to the invasion of Cape Sansapor, New Guinea in 1944. 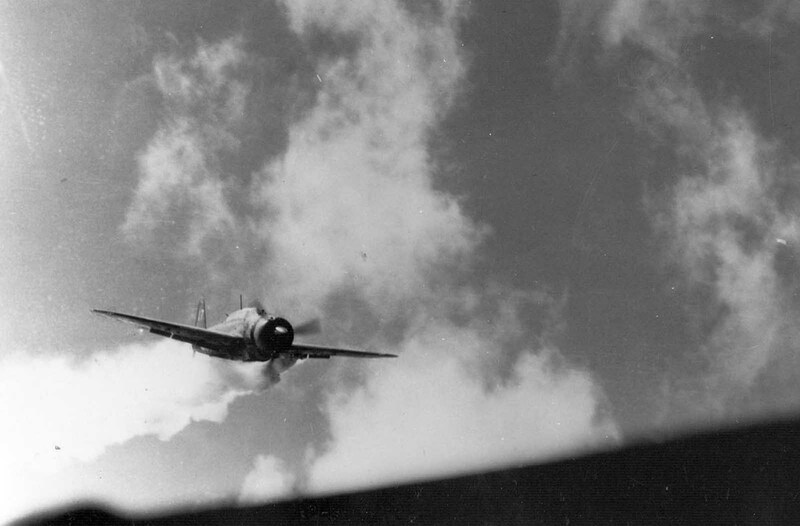 With its gunner visible in the back cockpit, this Japanese dive bomber, smoke streaming from the cowling, is headed for destruction in the water below after being shot down near Truk, Japanese stronghold in the Carolines, by a Navy PB4Y on July 2, 1944. Lieutenant Commander William Janeshek, pilot of the American plane, said the gunner acted as though he was about to bail out and then suddenly sat down and was still in the plane when it hit the water and exploded. As a rocket-firing LCI lays down a barrage on the already obscured beach on Peleliu, a wave of Alligators (LVTs, or Landing Vehicle Tracked) churn toward the defenses of the strategic island September 15, 1944. The amphibious tanks with turret-housed cannons went in in after heavy air and sea bombardment. 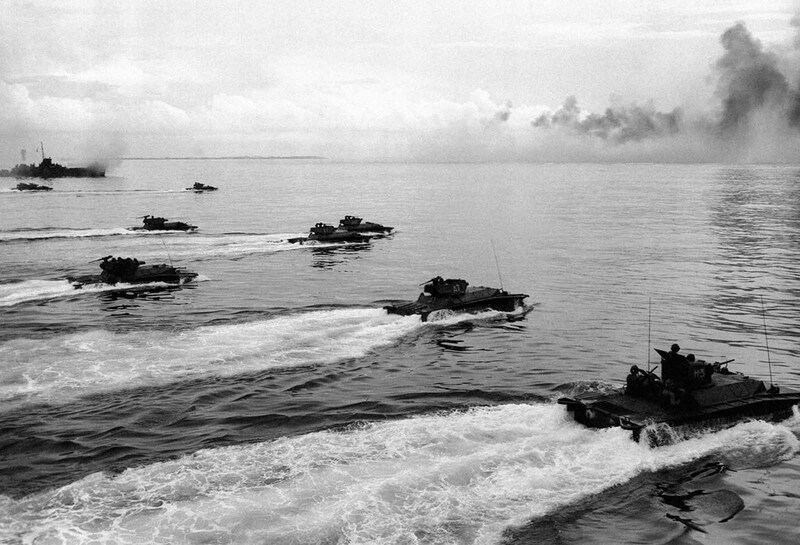 Army and Marine assault units stormed ashore on Peleliu on September 15, and it was announced that organized resistance was almost entirely ended on September 27. 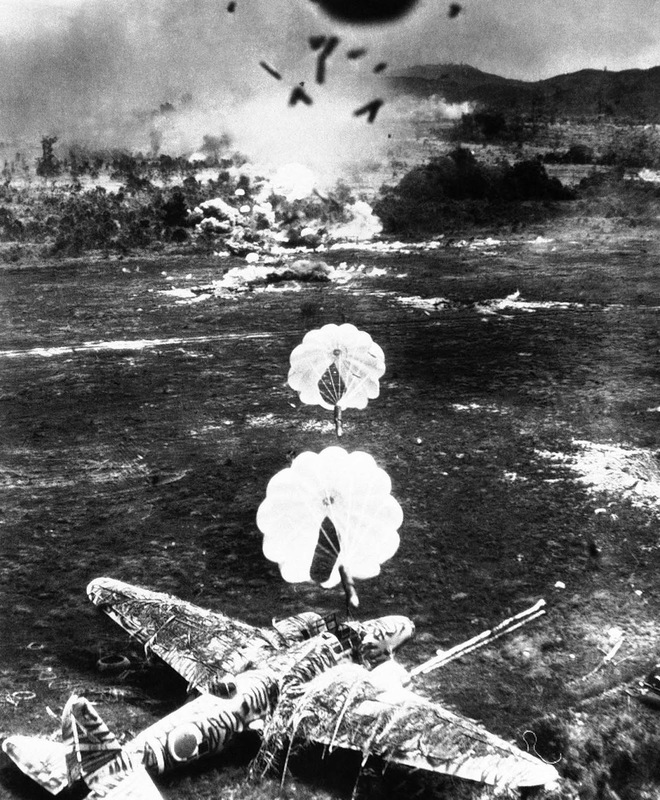 Para-frag bombs fall toward a camouflaged Japanese Mitsubishi Ki-21, “Sally”, during an attack by the US Army Fifth Air Force against Old Namlea airport on Buru Island, Dutch East Indies, on October 15, 1944. A few seconds after this picture was taken the aircraft was engulfed in flames. The design of the para-frag bomb enabled low flying bombing attacks to be carried out with higher accuracy. 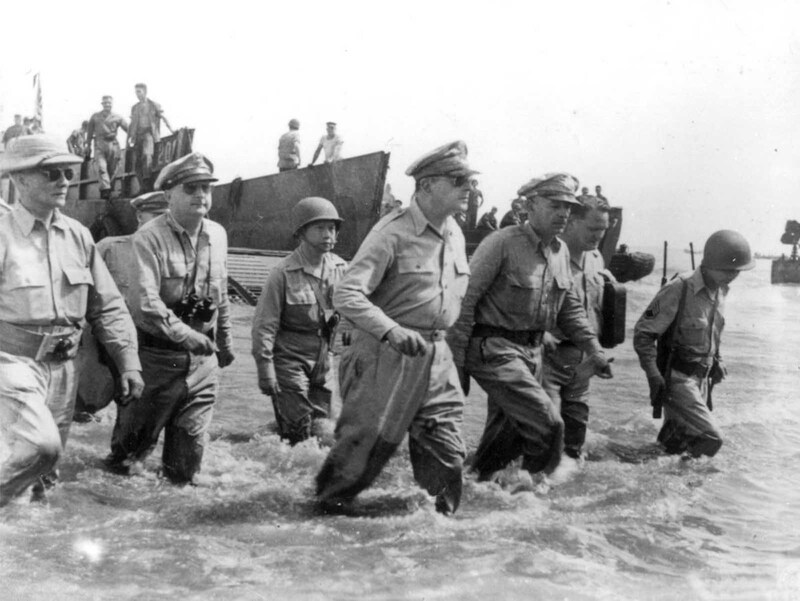 Gen. Douglas MacArthur, center, is accompanied by his officers and Sergio Osmena, president of the Philippines in exile, extreme left, as he wades ashore during landing operations at Leyte, Philippines, on October 20, 1944, after U.S. forces recaptured the beach of the Japanese-occupied island. 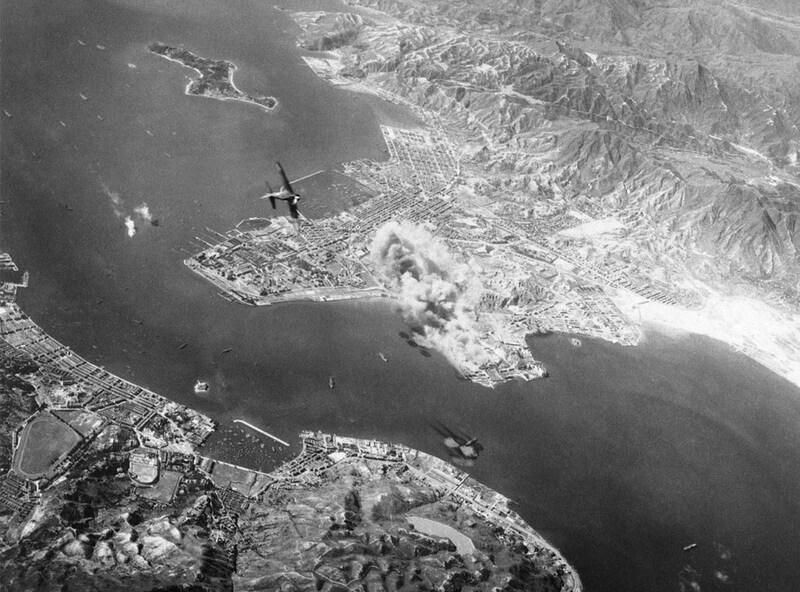 Smoke billows up from the Kowloon Docks and railroad yards after a surprise bombing attack on Hong Kong harbor by the U.S. Army 14th Air Force October 16, 1944. 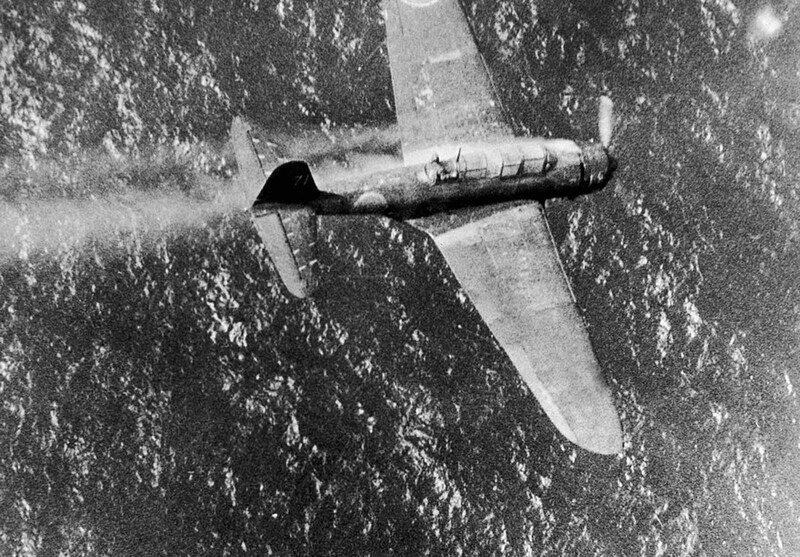 A Japanese fighter plane (left center) turns in a climb to attack the bombers. Between the Royal Navy yard, left, enemy vessels spout flames, and just outside the boat basin, foreground, another ship has been hit. 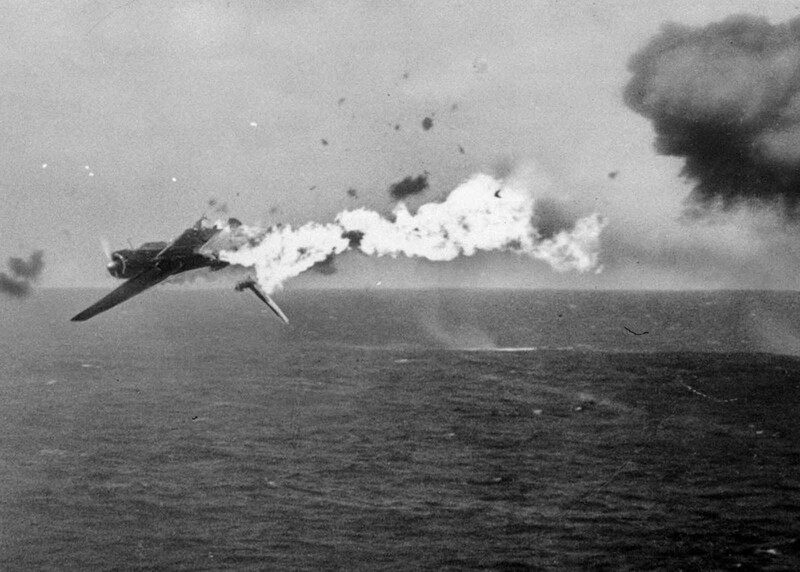 A Japanese torpedo bomber goes down in flames after a direct hit by 5-inch shells from the aircraft carrier USS Yorktown, on October 25, 1944. 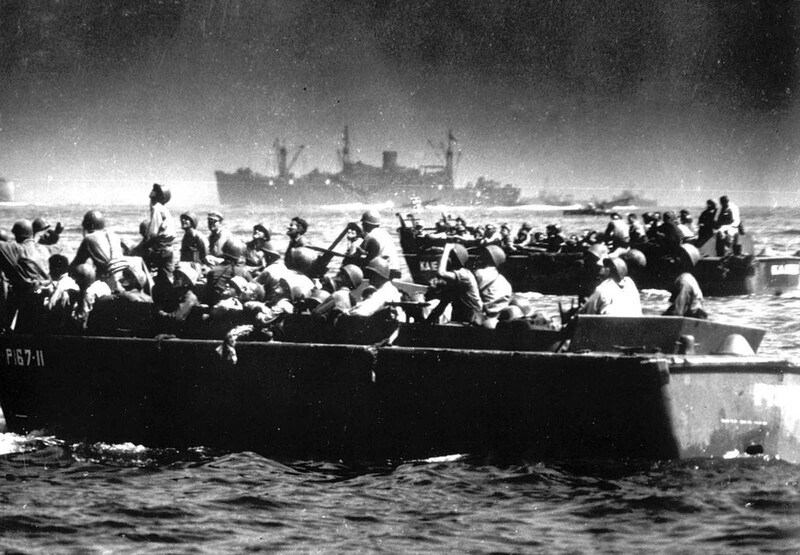 Landing barges loaded with U.S. troops bound for the beaches of Leyte island, in October 1944, as American and Japanese fighter planes duel to the death overhead. The men aboard the crafts watch the dramatic battle in the sky as they approach the shore. 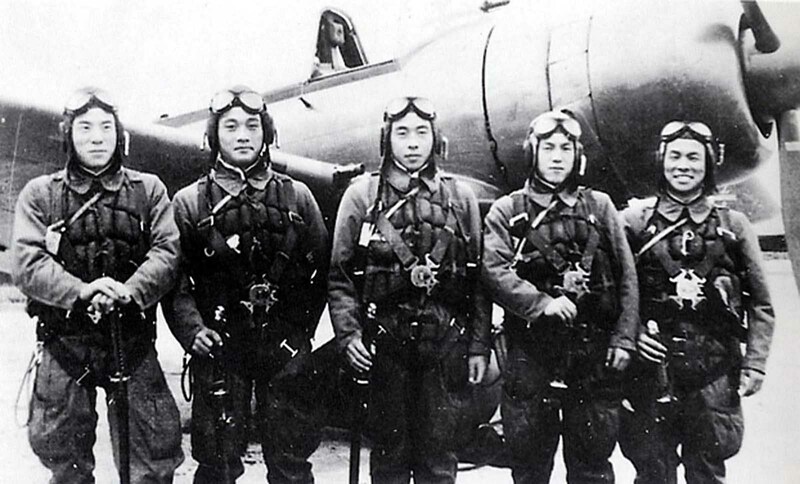 This photo provided by former Kamikaze pilot Toshio Yoshitake, shows Yoshitake, right, and his fellow pilots, from left, Tetsuya Ueno, Koshiro Hayashi, Naoki Okagami and Takao Oi, as they pose together in front of a Zero fighter plane before taking off from the Imperial Army airstrip in Choshi, just east of Tokyo, on November 8, 1944. None of the 17 other pilots and flight instructors who flew with Yoshitake on that day survived. Yoshitake only survived because an American warplane shot him out of the air, he crash-landed and was rescued by Japanese soldiers. A Japanese kamikaze pilot in a damaged single-engine bomber, moments before striking the U.S. Aircraft Carrier USS Essex, off the Philippine Islands, on November 25, 1944. 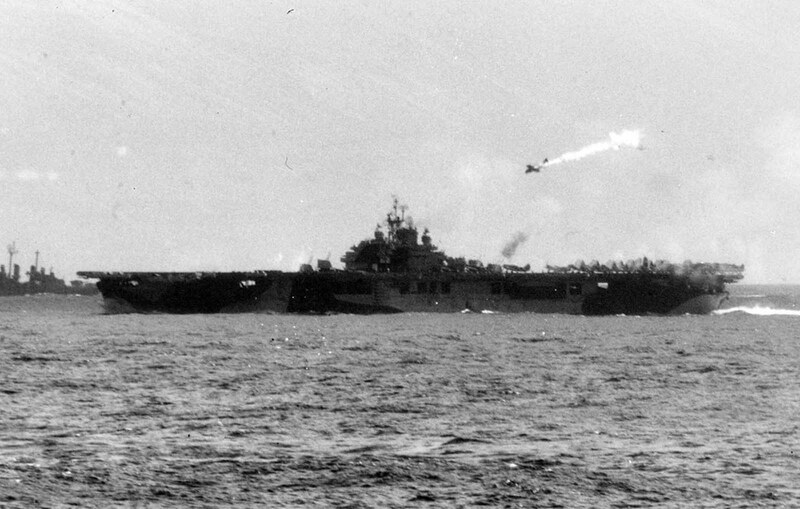 A closer view of the Japanese kamikaze aircraft, smoking from antiaircraft hits and veering slightly to left moments before slamming into the USS Essex on November 25, 1944. Aftermath of the November 25, 1943 kamikaze attack against the USS Essex. 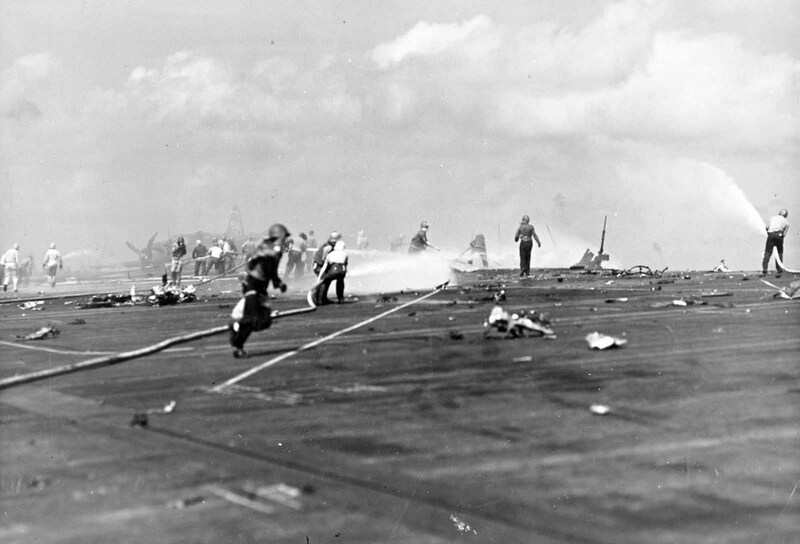 Fire-fighters and scattered fragments of the Japanese aircraft cover the flight deck. The plane struck the port edge of the flight deck, landing among planes fueled for takeoff, causing extensive damage, killing 15, and wounding 44. 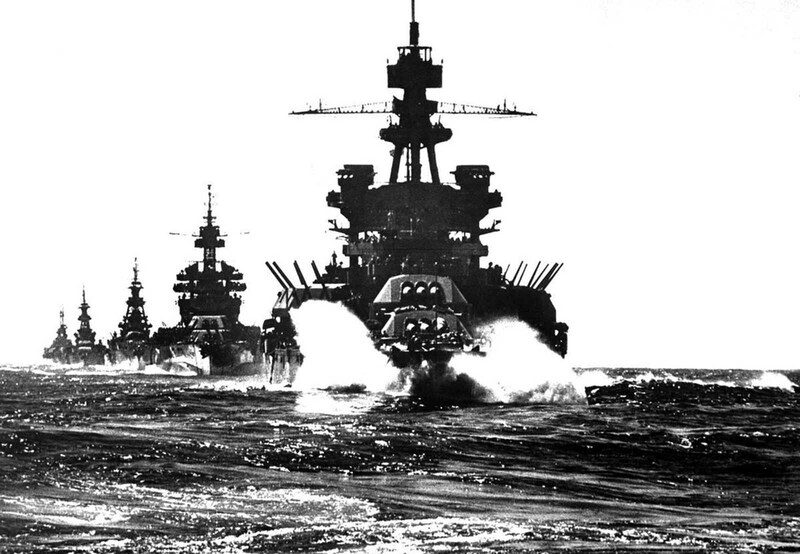 The battleship USS Pennsylvania, followed by three cruisers, moves in line into Lingayen Gulf preceding the landing on Luzon, in the Philippines, in January of 1945. U.S. Marines going ashore at Iwo Jima, a Japanese Island which was invaded on February 19, 1945. Photo made by a Naval Photographer, who flew over the armada of Navy and coast guard vessels in a Navy search plane. 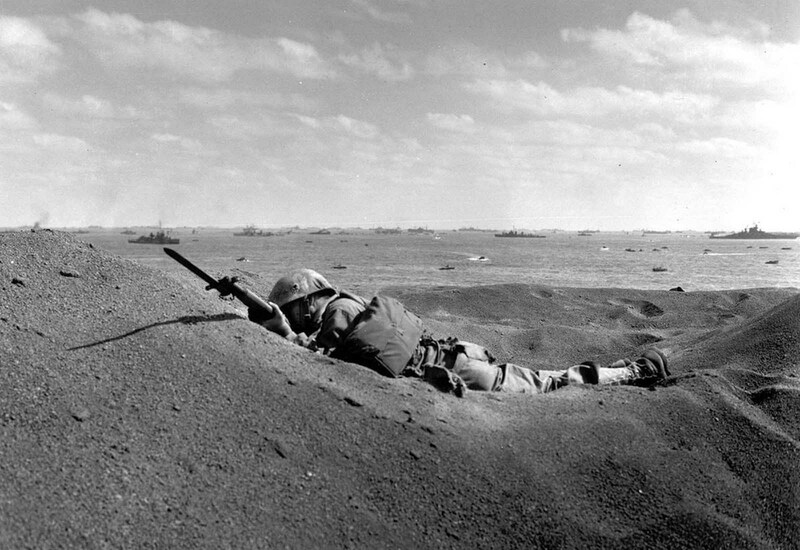 A U.S. Marine, killed by Japanese sniper fire, still holds his weapon as he lies in the black volcanic sand of Iwo Jima, on February 19, 1945, during the initial invasion on the island. In the background are the battleships of the U.S. fleet that made up the invasion task force. 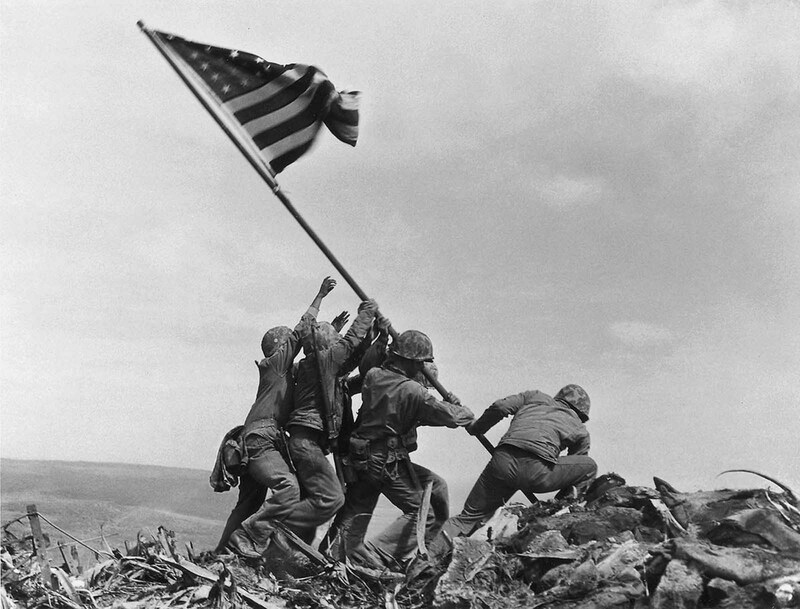 U.S. Marines of the 28th Regiment of the Fifth Division raise the American flag atop Mt. Suribachi, Iwo Jima, on February 23, 1945. The Battle of Iwo Jima was the costliest in Marine Corps history, with almost 7,000 Americans killed in 36 days of fighting. 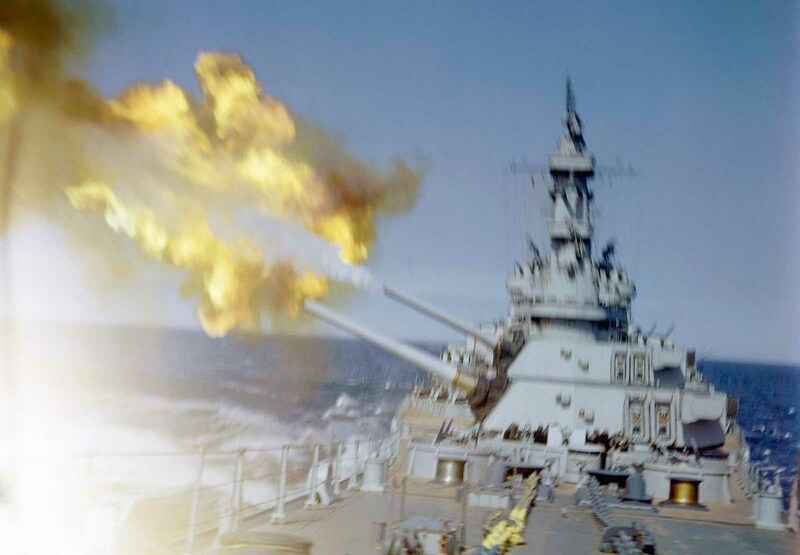 A U.S. cruiser fires her main batteries at Japanese positions on the southern tip of Okinawa, Japan in 1945. 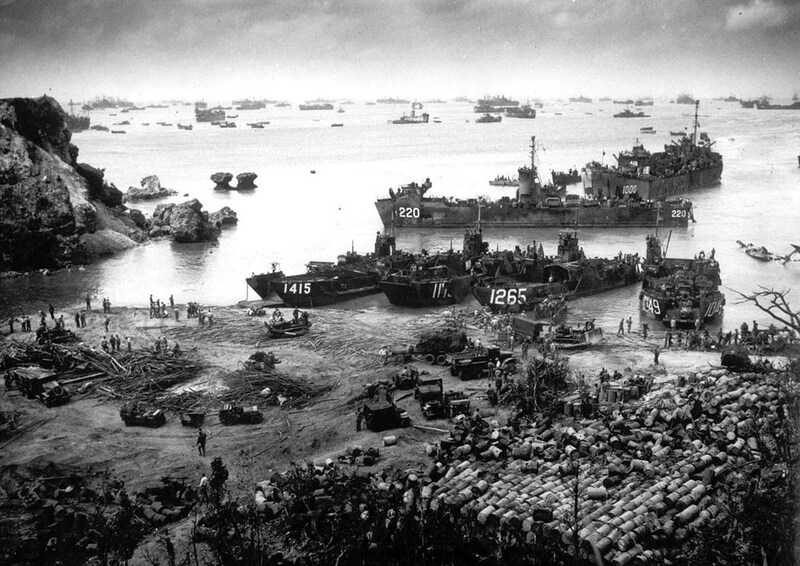 U.S. invasion forces establish a beachhead on Okinawa island, about 350 miles from the Japanese mainland, on April 13. 1945. Pouring out war supplies and military equipment, the landing crafts fill the sea to the horizon, in the distance, battleships of the U.S. fleet. 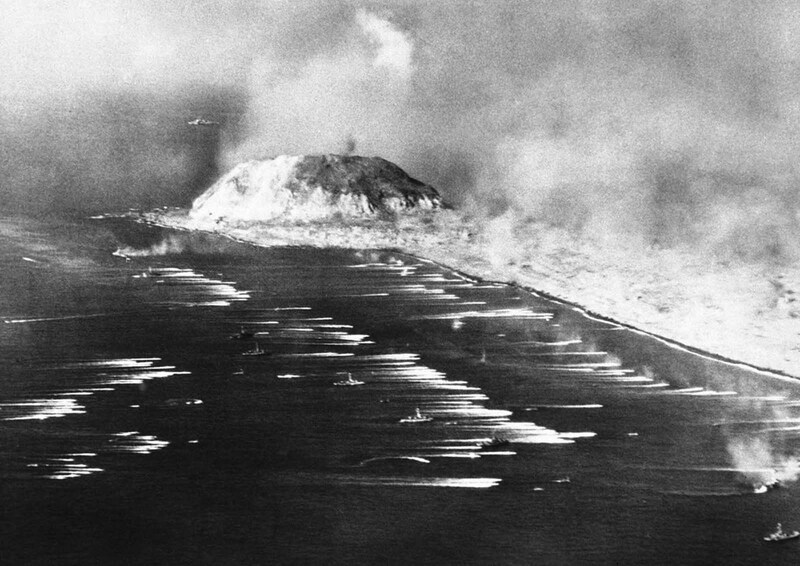 An attack on one of the caves connected to a three-tier blockhouse destroys the structure on the edge of Turkey Nob, giving a clear view of the beachhead toward the southwest on Iwo Jima, as U.S. Marines storm the island on April 2, 1945. 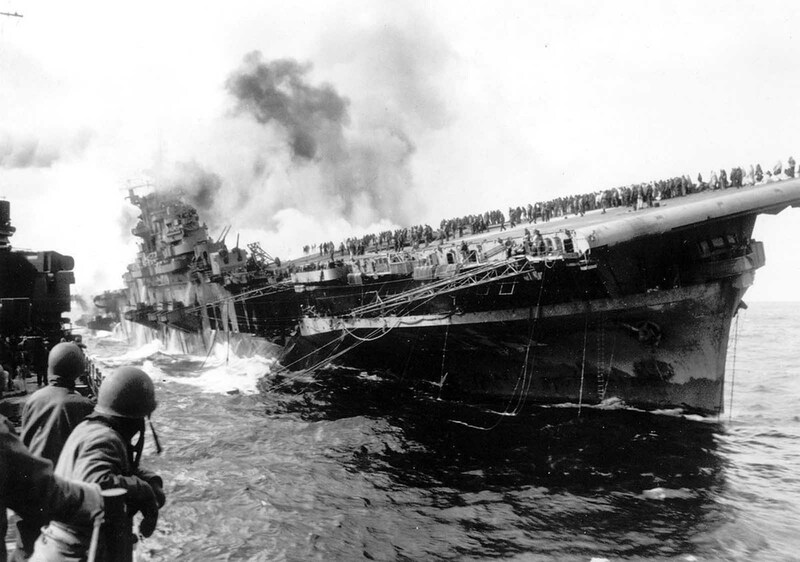 The USS Santa Fe lies alongside the heavily listing USS Franklin to provide assistance after the aircraft carrier had been hit and set afire by a single Japanese dive bomber, during the Okinawa invasion, on March 19, 1945, off the coast of Honshu, Japan. More than 800 aboard were killed, with survivors frantically fighting fires and making enough repairs to save the ship. 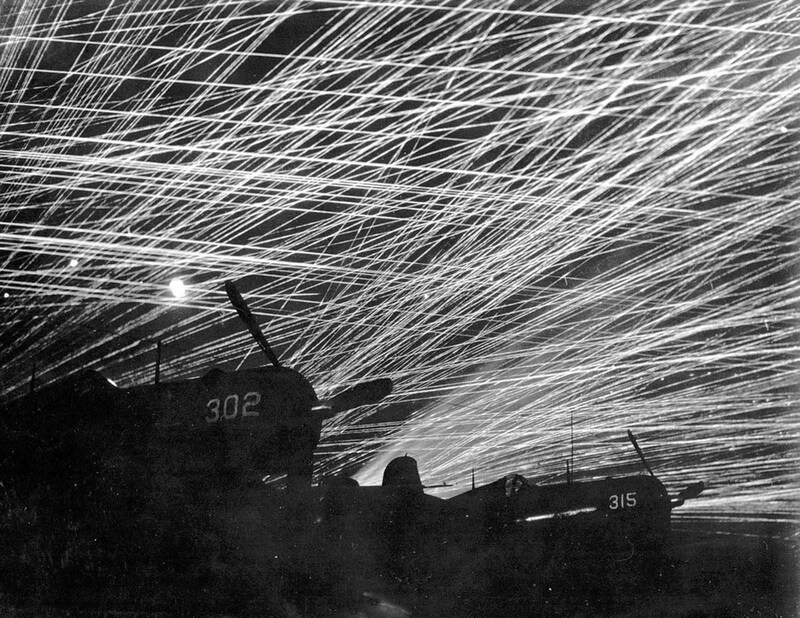 During a Japanese air raid on Yonton Airfield, Okinawa, Japan on April 28, 1945, the corsairs of the “Hell’s Belles,” Marine Corps Fighter Squadron are silhouetted against the sky by a lacework of anti-aircraft shells. (Photo credit: AP Photo / US Army).